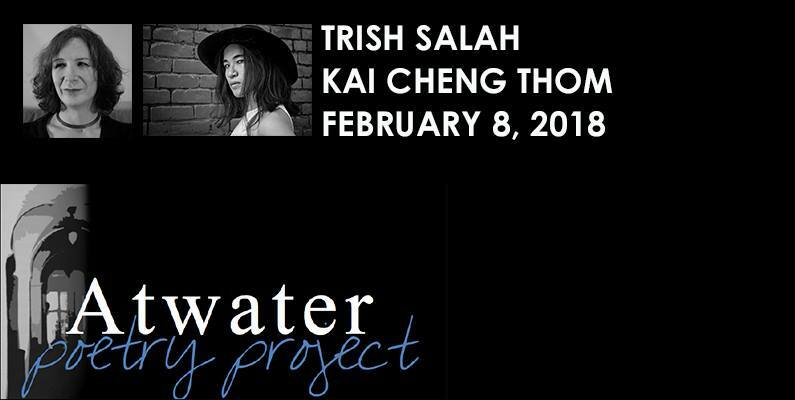 Join the Atwater Poetry Project for the first event of 2018 with readings by Trish Salah and Kai Cheng Thom. More details here & excerpted below. “KAI CHENG THOM is a writer, spoken word artist, therapist, wicked witch, and lasagna lover who divides her time between Montreal and Toronto, unceded Indigenous territories. Her poems and essays have been published widely on print and online, and she has performed in venues across the country including Verses International Poetry Festival and the Banff Centre for the Arts. Her first novel, Fierce Femmes and Notorious Liars: A Dangerous Trans Girl’s Confabulous Memoir was released by Metonymy Press in 2016, and her debut poetry collection, A Place Called No Homeland, was released by Arsenal Pulp Press in 2017. Born in Halifax, TRISH SALAH is the author of the Lambda Literary Award-winning, Wanting in Arabic, and of Lyric Sexology, Volume 1. Originally published in 2014 by Roof in New York, Lyric Sexology was released in an expanded, Canadian edition in 2017 with Metonymy Press. Salah is also co-editor of a special issue of the Canadian Review of American Studies, focused on Ann-Marie MacDonald’s Fall on Your Knees, and of an issue of TSQ: Transgender Studies Quarterly, focused on Trans Cultural Production. She is currently assistant professor of Gender Studies at Queen’s University, in Kingston, Ontario.